April 21, 2017 April 21, 2017 Vaibhav SComments Off on The Apple iPhone 8: Everything We Know About It! What To Expect From Apple? In this piece, we are going to talk everything about the upcoming Apple iPhone 8. At the moment various rumors are floating in the market which is obviously not confirmed as the company officially had no stance on it. Anyhow, after the launch of iPhone 7 and iPhone 7 Plus (RED) it is now expected that right after summer Apple is likely to launch its new flagship device which will be known as iPhone 8 and iPhone 8 Plus. It is expected that this device will have a unique design most probably with a glass body and the new iPhone is said to be bigger in size. 2017 will also go to mark its 10th anniversary of iPhone and Apple must have planned something to make this event an unforgettable occasion for everyone. Rumors suggest that it is going to be radical design with an edge-to-edge display and it is also being reported that Apple will remove the physical touch button from the front and in fact, will incorporate it in the screen. The Apple is in full swing to introduce a design which is like unseen for everyone they are trying it to make as sleek and stylish as it is possible for them to do. Multiple reports from different sources confirmed that the iPhone 8 would have three version, first a premium version with OLED and rest of the two with standard screen technologies. The size may vary from 4.7”, 5.5” and 5.8” inches and anyone model from these will feature a body covered with a glass finish. One rumor states that all the three versions will feature same glass body design with a stainless steel frame. It is being reported that iPhone 8 will feature a more advanced technology for improving the resistance towards the water. The new technology could have to make it possible for an iPhone to remain in water for up to 30 regular minutes in 1.5 meters of depth. So this means that it will not be totally water repellent but will have some more resistance power against water and just like in iPhone 7 the water damage was not a part of the official warranty program same looks for the iPhone 8 that Apple will keep this excluded from the warranty. 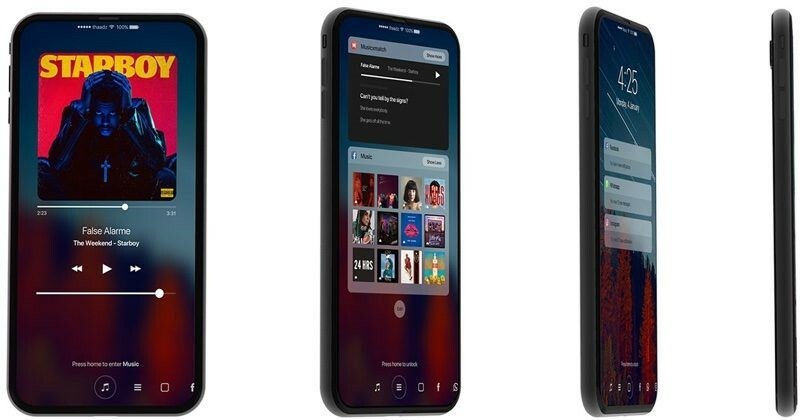 At this time it is really hard to say something that how the device will look like but based on the leaked news and mainly on rumors many YouTubers and designers have developed a sample concept design which somehow shows that the upcoming iPhone 8 will look like this. This was a concept design introduced by Brandao which is obviously based on rumors that are being floated in the market. As it is a known fact that in 2016 Apple signed a contract with Samsung for providing them OLED display and it is a documented figure that Samsung will produce around 160 million OLED panels for Apple. You should note that this deal was signed after the launch of iPhone 7 and 7 Plus so it is highly expected that in 2017 Apple can debut its new flagship device with a flexible OLED display. The best part of the OLED display is that it eliminates the need of for the backlighting for a standard LCD, but if Apple features an OLED display, they can surely reduce the thickness of the device which will provide room for Apple to cut the overall weight of the device and introduce something new. All the iPhone models that are going to be launched in 2017 are expected to use Apple’s A11 chip. The Volume creation on the A11 chip, based on a 10-nanometer FinFET fabricating process by Taiwan Semiconductor Manufacturing Company (TSMC), is relied upon to start in April, with a point of hitting a generation limit of 50 million units by July. The A11 chip is required to be both quicker and more power productive than the current A10, fabricated on a 16-nanometer prepare. It could present speedier execution and better battery life. Earlier it was reported that Apple is working on long-range wireless charging technology, but the most recent speculations and information suggest that instead of long range wireless charging Apple will bring an inductive style wireless charging solution for the device quite similar to the Apple Watch. This might be confirmed one because Apple has filed dozens of patents for inductive charging and the plan of Apple to use glass body hints that they will bring an inductive charging feature as glass would be required to allow charging through a magnetic coil. There are lots of amazing features that are expected to be included in Apple iPhone 8. But anyhow it cannot be said with any confirmation that following features would be a part of it. The rumors and as well as the reports both predicts that Apple is going to include a more accurate and advanced biometric security feature. It could be facial recognition or iris scanning feature using the front facing camera system. Nobody has elaborated that what additional biometric features would be used for but these would surely be the alternate methods for accessing your iPhone, or we can say that these would be the additional layers of protection. There will be no Touch ID fingerprint scanner as if there is no physical home button at the front. The iPhone 8 is expected to come with NAND flash memory from Samsung, but still, it is unclear that how they will customize it for the iPhone. The Apple iPhone 7 and iPhone 7 Plus introduced a 256GB storage option for the device if you want lots of space, but it is highly possible that any additional increases could be included in the iPhone 8.
iPhone 8 is rumored to have 3GB of RAM while one story suggests that only the high-end OLED model will include 3GB of RAM. But it is expected that all the three variants will feature a 3GB of RAM in all upcoming models. A new expected feature that could be included in the upcoming Apple iPhone 8 is the tactic engine which is an advanced technology of generating vibrations. It is a high-performance motor that will create more complex tactile vibrations. This type of engine could be necessary if Apple is really eliminating the home button. Likewise the earlier iPhone models the upcoming Apple iPhone 8 will surely have a 3D touch feature with more accuracy and reliability. With battery, there are different perspectives and rumors burning in the market. One story suggests that iPhone 8 will have a far bigger and powerful battery which is specially designed to hold on with the enhanced and advanced features in the upcoming device. The battery could be of 2,700 mAh power. Apple enthusiasts are claiming that the camera of iPhone 8 will beat all other cameras even of Samsung Galaxy S8 as well. It is expected to be a dual lens camera with 3d photography feature enabled in it. Likewise, the speculations aren’t clear yet that what is expected with the camera? But it is being claimed that both rear and the front facing cameras will be fantastic. We have seen in past that Apple has launched its devices right after summers i.e. in September or October and same is the case is with the launch of Apple iPhone 8 as it is expected to be launched in September 2017. Anyhow, we could say anything about the exact launch date because it is something that could not be predicted. Apple will announce the launch and release date officially along with the venue once they are done with everything. At the moment when you are reading this article the Apple has developed 10 different prototypes and have tested them as well (according to leaked information), this means that iPhone 8 is still not in the manufacturing states but is in the planning phase. It is still undecided that what is going to be included and what is going to be excluded from the device that is mentioned here. But 90% are the chances are confirmed that the said information in this article is a final verdict regarding the Apple iPhone 8 because most of the information used here is mined from really credible sources and it is quite hard for anyone to challenge it. But still being professional and honest we will say that it’s unconfirmed!